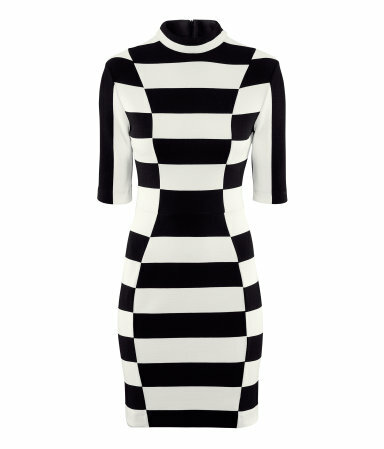 So who knew that a monochrome dress would first catch my eye and then swiftly catch my heart? Well, it’s not that unusual considering my life seems to be in black & white. Not in a strange you-need-your-eyes-testing kind of way, but just because if you don’t know already, black & white makes me go weak at the knees. Now, the dress shown here is not dissimilar to the dress I’m wearing in my previous outfit post… I realise that. But I just loooooove it so much and I’m determined to own it. It’s like a mission, I WILL own this dress, it has my name on it. It’s from H&M, costs £34.99 and is just so damn chic. If any of you have it, I hate you, you fashionable thing. If any of you have it in a UK size 8 and don’t want it, I love you. This entry was tagged 2013, and, Black, black & white, dress, fashion, february, H&M, monochrome, style, white, wishlist. Bookmark the permalink.